From television shows to movies, zombies are enduring ghoulish characters that never go out of style. Making a zombie costume using a T-shirt is inexpensive and easy to do. You can use common household items to create the destroyed, fresh-from-the-grave zombie look out of any basic T-shirt. Apply these techniques to a pair of pants or a skirt, and your zombie outfit is complete. Top it off with messy zombie hair, some fake blood at the corner of your mouth and your most ghoulish zombie walk. Cut tears or holes into the T-shirt with scissors. Focus cuts and tears around the neckline, sleeves and the bottom of the shirt. Fray the edges of cuts and tears by running a disposable razor over them. Make a pot of tea or coffee and pour it into a bowl. 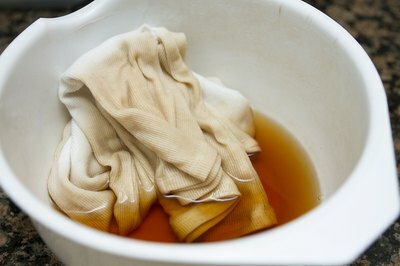 Soak the T-shirt in the tea or coffee overnight to give it an aged yellow cast. Hang it outside to dry. Rub the T-shirt around on the ground to create dirt and grass stains that give it that fresh-from-the-grave look. Sprinkle the front and back of the T-shirt with fake blood while it is still on the ground and let dry. You can purchase fake blood or create your own by mixing together 1 cup of Karo syrup, 1 tablespoon of water, 2 tablsepoon of red food coloring and 1 tablespoon of yellow food coloring. Cook a cup of spaghetti or rice. If you are using spaghetti, cut it into small pieces after it cools. 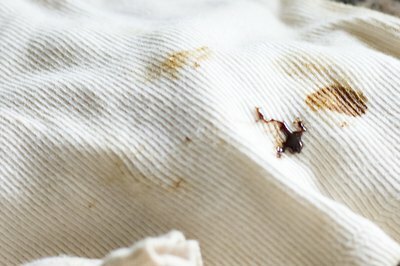 Throw handfuls of the cooked spaghetti or rice onto the shirt to look like maggots, and your ghoulish zombie T-shirt is complete. Who needs to buy a zombie costume? Learn how to make a homemade zombie costume for Halloween in this free video clip.